That's right. I've got chickens in my backyard. Right now. Right here in Los Angeles. In fact, that's Lottie in the photo below looking at you from the doorway of her coop. 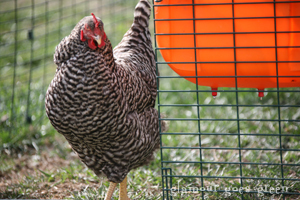 You can enjoy my chickens vicariously through my blog, Now and Hen! "As well as taking the award for the most imaginatively titled blog, Now and Hen also has lots of great content as the author keeps us updated on the life and times of her chickens. A great read!"